Please refer to our stock # JTB3101 when inquiring. A beauty!! 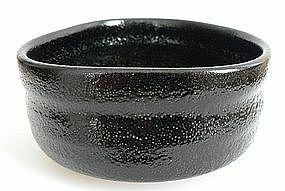 Black Seto Chawan. This chawan is made by Seto-based potter Sugiura Yoshiki(1915-? ), it reads Yoshiki on the base. Nice shape. Perfect to enjoy powered green tea (all season). Very good condition (please see photos). Width: 4.6". Height: 2.3". Weight: 0.59lb (270 grs).